Thanks so much for the great turnout last week at Be Inspired. We're all getting back into our routine after the Labor Day Weekend, and now we're ready for some Fall Fun. Here are the Top Three Visited Links from last week. You'll see why...take a peek! 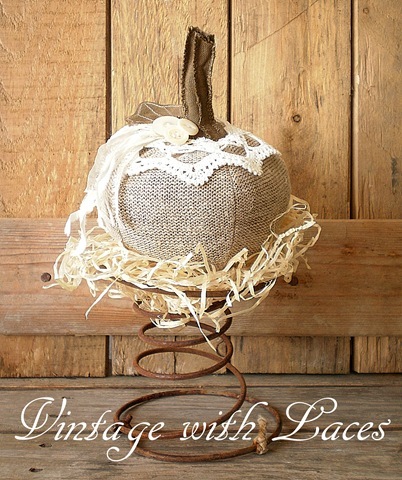 Julia from Vintage With Laces has been working on some Fall creations and shared this wonderful fabric pumpkin. Don't you love the rusty bedspring pedestal? 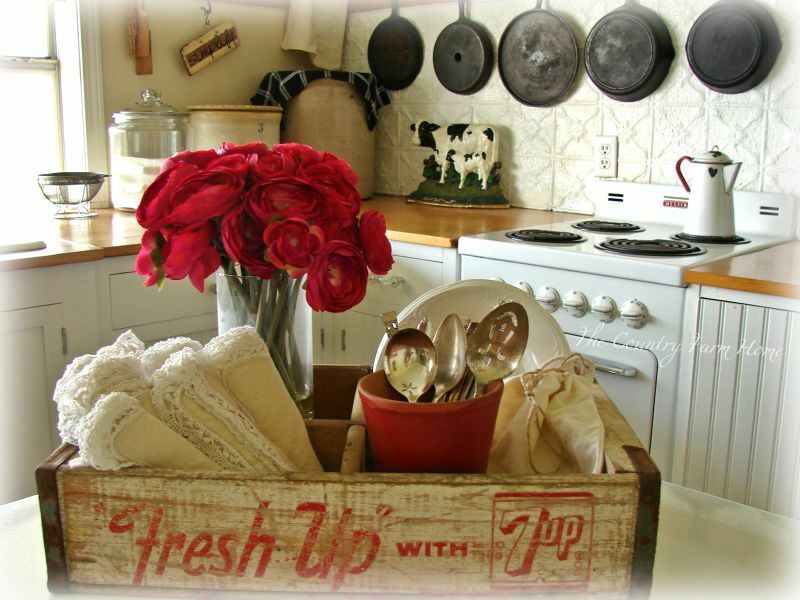 Dru from The Country Farm Home gave us part 2 of her reveal of her wonderful Farm Kitchen in all it's vintage farmhouse glory. 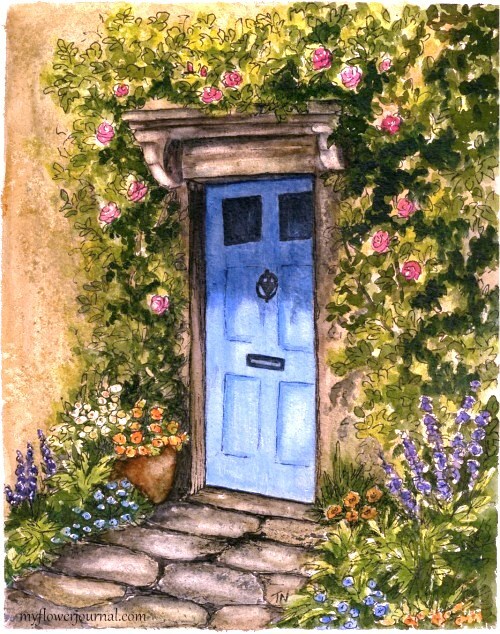 And Tammy from My Flower Journal gave us an amazing watercolor she painted after her trip to the English Countryside. She also shares her review of one of our favorite artist and author's newest book, A Fine Romance, by Susan Branch. If you haven't visited these talented ladies, please check out these links for more inspiration. Thanks so much Gals! Don't miss our Fall Soiree Celebration! and Halloween merchandise to debut! 11am- 2pm and dinner on the patio from 5pm- 8pm. On Saturday lunch will be served from 11am- 2pm. Great features. Wish I could come to your sale! Best of luck, I saw neat things!!! Hi. I was stopping by blogs in hopes I could get your help....I've been nominated on Martha Stewart and I was trying to get Votes to help Win...if you have time I would love to see you come by, Vote and also entry in a giveaway for your support!! Your able to vote 6 times in a row daily until Sept. 13th!! I would greatly appreciate it!! Thanks so much! BTW...Love your blog....the halloween pictures are so cute! I'm not surprised these were the top three, Debra! Love all of them and the pictures from Robin's Vintage Suitcase. It looks like they are all ready for Fall and Halloween. I still need to get some Fall things in to decorate my booth. I remember that cute shop! I have that photo of the statue wearing the hat pinned on Pinterest, and it is one of my favorites! Looks like such a beautiful place. Wish I was closer. What a lovely display of goods! Very creatively merchandised with great eye appeal. If you're a local and you're NOT the early bird at that shop, you're DEFINITELY missing out! 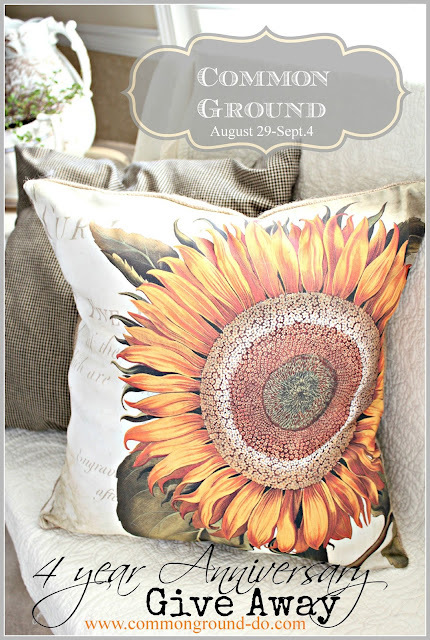 Thank you for the lovely feature, Debra! I hope you're feeling much better in the meanwhile. I wish I could come to that show. It looks very promising. gorgeous flowers growing around your front door!!! Thank you for a lovely post!! Oh, that bat pillow is so cute and bright! Lots of lovely Fall ideas. Oh how I wish I could come to your fall soiree! Everything looks so enchanting. 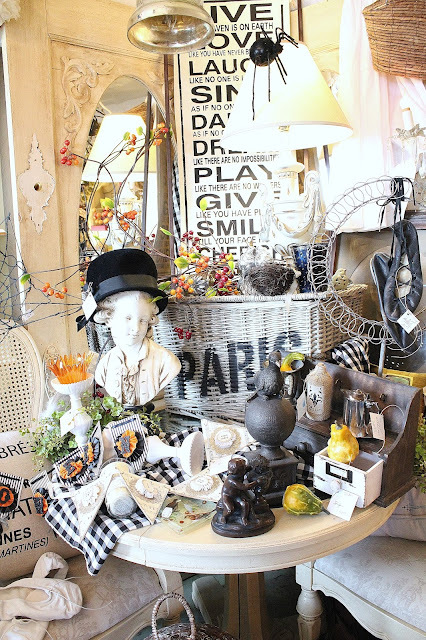 Lot's of eye candy and Fall inspiration.